I found my first Alexander Gardner CDV! I’m very excited. It’s a really cool image of a large group of what could be a family, four couples, or just eight random friends. None are identified. I’ve been hunting for a Gardner CDV for a while now, as they don’t seem to be all that common, unlike the Brady CDVs which show up frequently. I was intrigued by the group dynamic – is this a family? Some of the men appear related, but one doesn’t fit. The couples, if in fact they are four married couples, are not arranged in any particular pairings. Could they just be a group of (extremely well-dressed) friends who dropped by the studio? And what’s with the odd composition showing the group bunched to the side, and the head clamp sitting in the corner by its lonesome? Very odd. It makes the image rather self-reflexive, calling attention to the fact that it is a photograph, not a painting, by reminding us of the process of taking a wet-plate image. Is it perhaps a sign of virtuosity, suggesting that the head clamp was not required? Or was it just sloppy workmanship and by the time they realized they forgot to put the head clamp out of the way, it was too late, and the sitters said, “well, that’s ok we’ll take it anyway”? 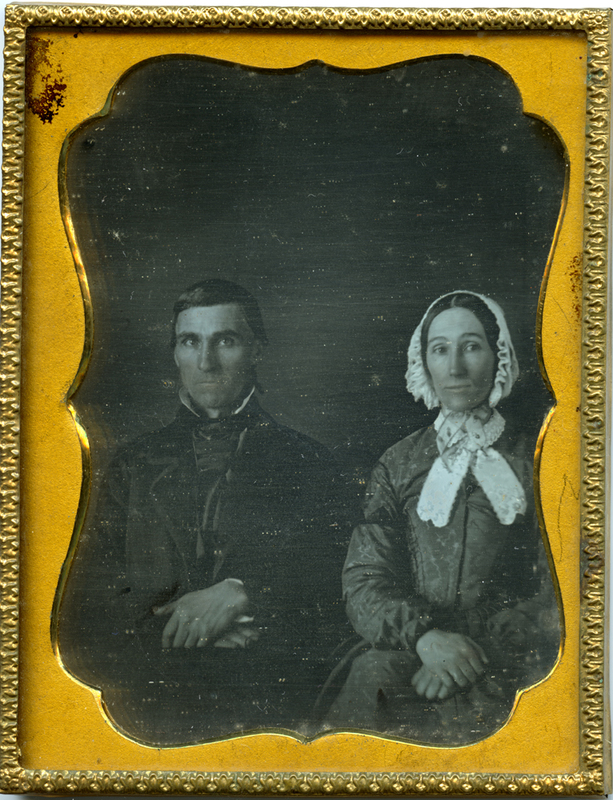 Another recent acquisition is a quarter-plate daguerreotype I found in an antiques mall outside Charlottesville, Virginia. This was a fortunate find – not only is the image larger in size than you normally see, but the image quality and preservation is overall quite good (the original seals are intact), and the case, though worn, is complete and still maintains the original hinge and clasps. The image is probably from a Charlottesville area estate, but no identifying information was provided with it. I did remove the packet from the case and discovered the names of the subjects scratched into the paper lining – I’ll have to grind a pencil lead on some sandpaper to make some carbon dust and try to get the characters filled in so I can read the inscription and identify the sitters. I’ll post a photo of it when I have figured out what it says. Apologies for the color of the image – this was my first time scanning a daguerreotype, and the image itself came out more blue-green than it is in reality. I was concerned about over-correcting and turning the mats some garish shade of yellow that they’re not, so I left it alone this time. This was another intriguing composition – almost all the dags I’ve seen and bought before have some kind of background and/or props for the sitters. This looks like the couple is against a black backdrop, almost as if they’re floating in space. And the large dead space at the top of the frame is interesting too, from a compositional standpoint. They are both wonderful but particularly the A. Gardner item. The composition is extraordinary for the time. What a GREAT find! There is something that links them together but I don’t think family or marriages. 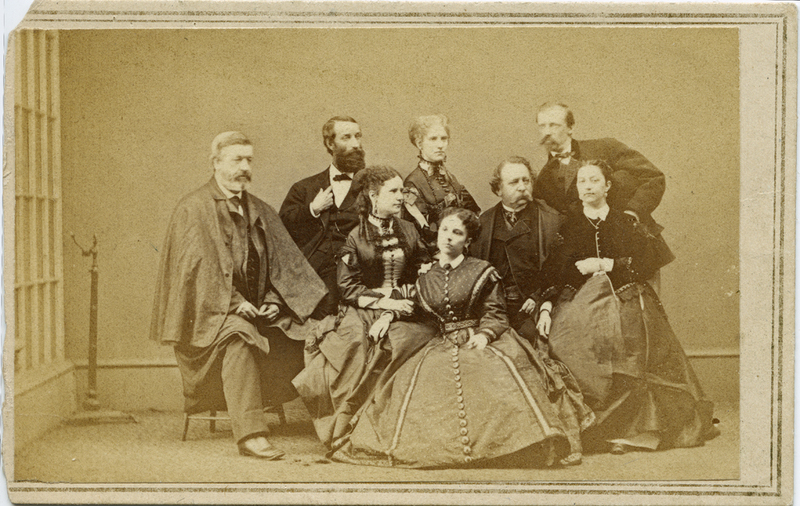 Wouldn’t it be marvellous to discover that you have found a photo of a club or society of intellectuals, artists, photographers? I really do love this photo!